The Pain and Suffering of Jesus (Catechism and Bible references noted; for other references regarding the pain and suffering of Jesus, see footnote below). Experiences the pain of being human – Jesus “became flesh in assuming a true humanity“ (CCC 476) and felt the many physical and emotional pains of being human. Thomas Aquinas assures us that “Christ endured every human suffering” and that “Christ’s pain was the very greatest.” (Thomas Aquinas, Summa Theologiae; III, q. 46). From an early age, Jesus feels a longing for the Father – At 12, Jesus feels the longing for God in the temple, though He obediently returns with Mary and Joseph (Luke 2:41-50). Suffers during the Temptation – Jesus fasts for 40 days and felt hunger (Matt 4:2). Lives a physically demanding life – A first century carpenter needed great physical strength and stamina and Jesus experienced fatigue and soreness. As itinerant preacher, Jesus walked many miles (one source suggests almost circumference of the earth; 25,000 miles) and felt fatigue. Anticipates the great suffering of the Passion – As early as the Marriage at Cana, Jesus realizes that His “Hour” is coming (John 2:4). He predicts His Crucifixion and death multiple times. Feels sorrow – Prior to raising Lazarus from the dead, “Jesus wept.” (John 11:35). Later, after the cleansing of the Temple, Jesus poignantly laments and weeps over the waywardness of the people of Israel (Matt 23:37-39; Luke 19:41-44). The western world has entered a new age of moral darkness (see Evangelium Vitae, Building a Civilization of Love). Under the guise of “enlightenment” and modernity, human dignity and freedom are being increasingly suppressed by a secular totalitarian state. Assaults against the dignity of human life are pervasive through legalized abortion, euthanasia and embryo destruction/genetic manipulation. Culture elites, the media and liberal activists are promoting sexual “freedom”, including the “hook up” culture and the homosexual micro-culture through mass media and the Internet. Government, academic, cultural activists are seeking to both denigrate and restrict religious liberty by enacting laws and regulations to force the acceptance of contraception, abortion and homosexual “marriages” against religious conscience. There is a grave assault occurring on the Body of Christ. The majority of people are being engulfed by the growing moral darkness. Millions of children are being aborted and many millions are being born to single women. Large and growing numbers of adults are forgoing marriage or choosing to divorce, gravely injuring themselves and their children. Depression and suicide rates, especially among young people, are growing. Worse, growing numbers are losing sight of their eternal salvation, living their earthly lives without the light of Christ. Many men are confused and afraid to respond to the darkening culture. Some mistakenly attempt to “man-up” by engaging in thrill-seeking behavior (X-treme sports, flash mobs, etc. ), sexual conquest, wild partying or in “manly” activities (hunting, fishing, sports, etc.). Others retreat into perpetual adolescence, fade into feminization or succumb to homosexualization. In the face of mass moral confusion and the relentless cultural pounding of “political correctness”, rather then standing and defending the moral high ground, men are being cowed into timidity or distracted displays of false courage. Sadly, many Catholic men falter in courage and fall into cowardice. Christ perfectly demonstrates the virtue of courage to en-courage men. The word “virtue” is defined as a “manly moral strength” and comes from the Latin, vir, meaning “man.” Courage, or fortitude, is one of cardinal virtues (CCC 1805), is one of the seven gifts of the Holy Spirit (CCC 1831), is defined as “to make strong, to hearten” and comes from the Latin, cor (heart). Learns courage from the Virgin Mary and Joseph – Jesus Christ begins life as a refugee, His earthly father Joseph and the Virgin Mother escape Herod’s slaughter of the Innocents (Matt 2:13, 16). Jesus is raised, knowing the great courage of Mary’s fiat and Joseph’s chaste heroism and their total commitment to serve God in the face of persecution. Stands up against Satan – Jesus stands up to and defeats Satan (1 John 3:8) when tempted in the Wilderness (Matt 4:10), by repeatedly casting out demons (cf. Matt 8:28-34) and by using the Satan-inspired evil of Judas (Luke 22:3) for the Glory of the Cross and Resurrection (CCC 2853). He defeats Satan on his home turf (Hell) when Jesus descends to offer His “redemptive works to all men of all times and all places…” (CCC 634). Christ’s courage against absolute and powerful evil is unflinching. Evangelizes despite the ongoing plots to kill Him – After John the Baptist is imprisoned and eventually murdered, Jesus returns to Galilee to pick up where John left off (Mark 1:14). On many occasions, various groups plan and attempt to kill Him (John 5:16; Mark 7:5; John 7:30; John 8:59; John 10:20; Luke 13:31; John 11:53; Luke 19:47). Jesus courageously persists despite the murderous plots. Stands up to false teachings of the Jewish elites – Repeatedly, He confronts the Pharisees and the Sadducees and provocatively corrects their falsehoods. He heals the paralytic (Mark 2:7) and the man with a withered hand on the Sabbath (Matt 12:10) to demonstrate His authority (Mark 2:7). Jesus pronounces the blasphemy of the Holy Spirit of the teachers of the law (Mark 3:22). He pronounces woe on the Pharisees and the experts of the law for their hypocrisy (Luke 11:53-54). Despite constant death threats, Jesus authoritatively teaches in the temple during Passion Week (Mark 11:27-28). Stands up against corrupt economic powers – Jesus confronts the merchants and moneychangers and single-handedly clears the massive (35 acres) temple area (John 2:2:18; Matt 11:18). Stands up against bloodthirsty mobs – Jesus braves the Nazareth mob that tries to cast Him off a cliff (Luke 4:28-29). He stands up to the bloodthirsty mob that is going to stone the adulterous woman (John 7:53-8:11). He protects the disciples from the violent legion when He is taken in the Garden (John 18:8). Jesus Christ alone is unafraid and courageous against any and all ruthless mobs. Overcomes His anguish in Gethsemane – Jesus Christ, knowing full well the physical torture He will endure, sweats blood in His anguish but courageously accepts the Father’s will (Mark 14:32-42). Stands up against the Romans – Despite the well-known horrific tactics of the Romans, Jesus Christ does not falter when questioned by Pilate, knowing that Pilate could spare Him (Matt 27:1-26). Endures persecution and torture courageously – Though Jesus has many chances to recant or to finesse His Gospel, He does not yield, enduring beating, scourging, being forced to carry His Cross and being crucified (Matt 27:27-50). Accepts death on the Cross with courage – Jesus makes an infinite sacrifice, for His life is of infinite value and he gives it for the sins of all mankind. He chooses a horrible death freely (John 10:18), saying, “Greater love has no man than this, that a man lay down his life for his friends” (John 15:13). In this, Jesus teaches to face the “hour of death” with courage (CCC 1014), promises to send the Holy Spirit to provide courage in old age and illness (CCC 1520) and gives men the strength to be martyrs for Christ (CCC 2473). Experiences the desecration of His Father’s House – He violently cleanses the temple of the money-changers and traders which He refers to as a “den of robbers” (Mark 11:17). The disciples interpret Christ’s emotion as “zeal” (John 2:17). The poignancy of the Last Supper – We can imagine that Jesus experienced both joy but also poignant sorrow at the trials He would face, the betrayal/death of Judas and the scattering and coming anguish of the disciples. Experiences agony in Garden of Gethsemane – Knowing from practical and His Divine experience of the horrors of crucifixion, He prays, alone, uncomforted by His sleeping disciples. Jesus sweats blood (Luke 22:44), a rare and painful condition called hematidrosis that occurs during times of great stress/mental suffering, leaving the skin extremely tender and fragile. Dehydration has begun. Experiences the failure of His disciples – In the Garden, Jesus experiences the betrayal of Judas, who ironically betrays Him with a kiss (Luke 22:48) and the violence of Peter (Luke 22:51). Predicting that Peter will deny Him, Jesus then witnesses Peter’s denial (Luke 22:61). Goes without food, drink and sleep – From the Last Supper, Jesus goes without food, water or sleep during a time of significant stress and physical exertion. He is forced to walk over 2 miles as He is paraded before the Jewish leadership, Pilate and Herod. Is beaten and brutally scourged – There are several instances where Jesus is struck in the face and head (Matt 26:67 27:30) causing bruising and swelling. His nose was battered and swollen. The scourging (Matt 27:26) ripped His flesh in places to the bone, leaving over 120 wounds over His back, sides, legs and arms which ooze blood/plasma. 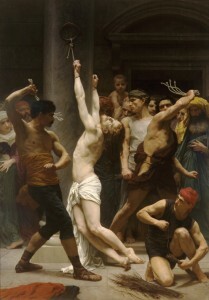 His head is punctured with the crown of thorns – The nail-like thorns penetrated the skin in many places and perhaps the skull, causing great pain and a marked loss of blood (Matt 27:29). Struggles with the Cross – Jesus carries the Cross with help from Simon of Cyrene (John 19:17) a distance of almost ½ mile uphill. The Cross is heavy (100-200 pounds) bruising His shoulders. He falls three times scraping the skin off His knees. Is Crucified – Weakened, He is nailed to the Cross with iron spikes that were driven through His palms and feet (John 25:20). The nerve density makes these wounds particularly painful and there was a significant loss of blood. Mentally suffers on the Cross – He waits for death, watching Mary, John and others grieve for Him. He feels sorrow for those who kill Him, asking “Father forgive them, for they know not what they do” (Luke 23:34). He cries out to the Father in anguish (Matt 27:46). Physically suffers and dies on the Cross – For three long hours, His many wounds hurt. He struggles to relieve the searing nerve pain and ripping flesh by nails. His shoulders ache as the joints are pulled. He thirsts due to lack of water and dehydration from blood loss and sweating. His painful cause of death by some combination of loss of blood, shock and asphyxiation. Question 1 – What aspects of Jesus’ pain and suffering touches you most? Question 2 – How can the example of Jesus help you in your own pain and suffering? Pierre Barbet, A Doctor at Calvary (Fort Collins, Roman Catholic Books, reprint 1993); William D. Edwards – On the Physical Death of Jesus Christ (The Journal of American Medical Association, March 21, 1986; V 256); Frederick T. Zugibe, A Forensic Way of the Cross (International Science Symposium, March 2000). The following is the talk that Father Christopher Beaudet gave at the Delano ManNight on March 25, 2011.